Dalla sua nuova residenza a Granada (Spagna) Martin Davidson rilancia le attività dell'etichetta Emanem - che quest'anno festeggia i propri primi quarant'anni - annunciando nuove produzioni e l'avvio presso il negozio norvegese non-profit Subradar della distribuzione in download di alcuni titoli in catalogo. 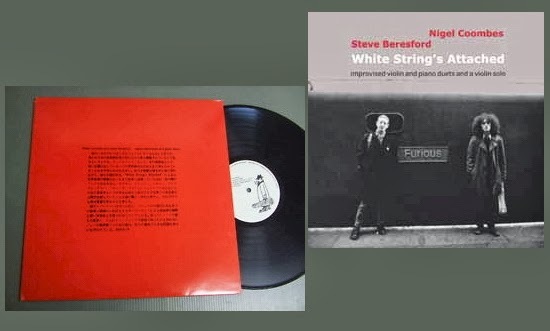 Tra le prime iniziative c'è la ripresa - anche in cd - in versione riveduta, corretta e ampliata dell'album di Nigel Coombes e Steve Beresford White String's Attached, in origine un LP per Bead (1980). All'epoca scrisse Eugene Chadbourne: "Violinist Coombes explains things perfectly in his hilarious liner notes. Nonetheless, a blindfold test of this record to a knowledgeable listener often results in the music being misidentified as, say, a composition by Charles Ives, and rarely as an improvised piece. By the time of this recording, these players had been working together in a variety of contexts and could almost read each other's thoughts, though with music this demented that might not be a good idea. Coombes was a striking figure in this era; a slight, lean Englishman with an Angela Davis-type Afro, who was often clad in a dark duster. He would play on and on, often sounding like a collection of classical violin records being run through a cherry stoner. These duets are, above all, truly enjoyable to listen to. The timing is uncanny, as is the sense of drama. Decisions as to when to play hardly anything and when to unleash a bucketful of notes are intelligent, and often surprising." Dopo il corposo Jazzbox dello scorso anno, volto a seguire le ironiche sorti del batterista free innamorato della tradizione, un nuovo plico di cd prova a catturare aspetti dell'irrefrenabile creatività del poliedrico Sven-Åke Johansson, evidenziandone stavolta il profilo dello schietto compositore: More Compositions, selezione da vent'anni di scritture e interpretazioni affidate - oltre che a se stesso - agli ensemble più disparati, con dovizia di timpani, arpe, flauti, cori e motociclette (Harley Davidson). 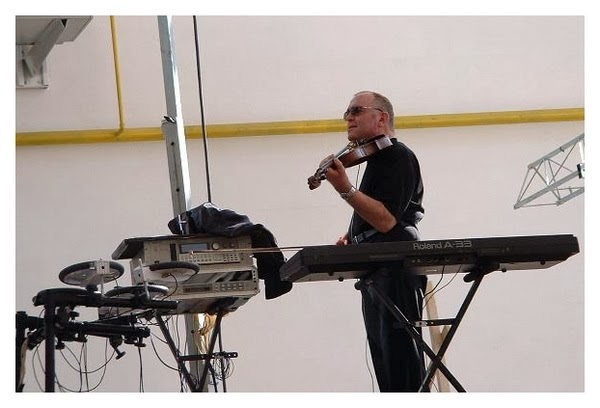 C'è anche un bel brano del 2007 per violoncello preparato e spazzole, In Memoriam Tom Cora. Mujician dal vivo a Manchester il 22 maggio 1997? Yes please... Dal vivo a Toronto due anni dopo? Yes pleeeeease! Una lunga intervista a Gérard Hourbette, quasi un compendio di quarant'anni di musica, composizione, direzione artistica e art bizarroïde, è stata realizzata poco tempo fa da KoSmik muZik ed è ora pubblicata come file audio su SoundCloud: "Gérard y revient sur certains points marquants de sa "carrière", de ses projets, mais aussi de l'actualité d'Art Zoyd... C'est passionnant et Gérard est un conteur de talent, loquace. Cela tombe bien, c'est aussi ce qu'on aime chez lui!". Altre interviste a Hourbette, anch'esse recenti, sono trascritte in Musiques Nouvelles 50 e It's Psychedelic Baby. 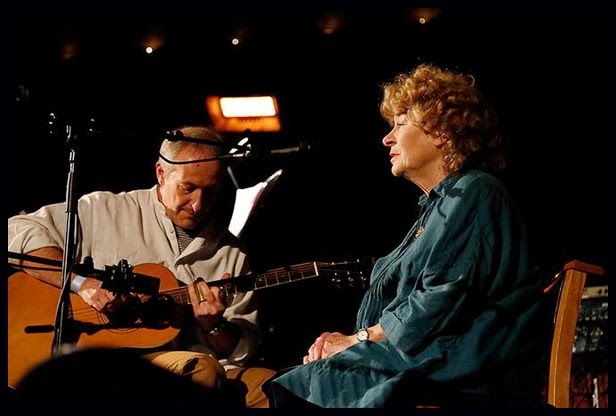 Due sole canzoni - All The Pretty Little Horses e Death and the Lady - per il brevissimo ritorno sulle scene di Shirley Collins, a più di trent'anni dall'ultima apparizione dal vivo. Ha propiziato l'evento a Londra David Tibet, con un concerto presso la Union Chapel di Islington lo scorso 8 febbraio cui hanno partecipato anche Macgillivary e, principale attrazione, Current 93. Ne hanno scritto The Quietus e The Guardian. Ne ha scritto anche Michael Rodham-Heaps: "Now in her late seventies, she crossed the stage with Ian Kearey who sat down to accompany her on guitar. The crowd’s appreciation was deafening. Seated, she stated “I wouldn’t have done this for anyone else other than David Tibet.” A further massive applause followed, then faded to a gorgeous rendition of All The Pretty Little Horses. The vocal was warm, aged, reflectively twisting, the “peck out eyes” bit ringing in my ears as the golden accompaniment bounced the chapel walls like imaginary hooves. The approval was astounding… “You’re far too kind,” she stated modesty and pleaded with us to “stop clapping before I burst into tears and ruin the next song.” I had tears for her… she was so sweet and humble. The next (and very last) song was a folk-fold of a “maiden meets death in the woods” (Death and the Lady, NdR), a prophetic tale where the maiden in question bargained for extra life, but couldn’t escape death’s inevitable embrace, Shirley’s deep voice echoing its pathos perfectly". 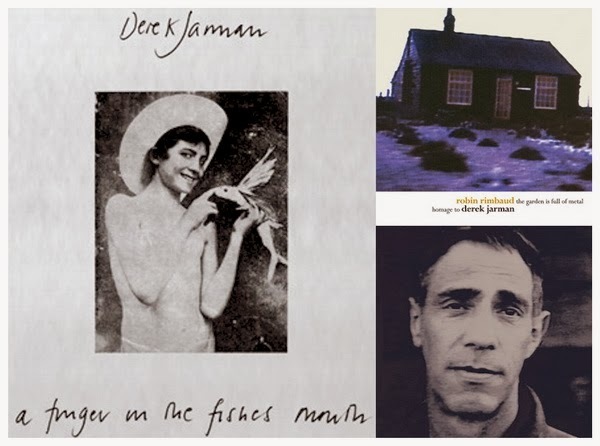 Alle numerose iniziative che a Londra, ma non solo, commemorano Derek Jarman a vent'anni dalla scomparsa - mostre, proiezioni, allestimenti, conferenze pubbliche e visite guidate - si aggiunge la pubblicazione del rarissimo libro di poesie e illustrazioni A Finger in the Fishes Mouth, in un'edizione a tiratura limitata curata da Test Centre, e l'omaggio sonoro The Garden is Full of Metal realizzato a suo tempo da Robin Rimbaud per Sub Rosa, oggi disponibile in una versione riveduta e ampliata. Da non mancare la lettura del pezzo di Neil Bartlett il mese scorso sul Guardian. Per la sua seconda produzione, l'etichetta Kemal recupera dall'omaggio a Mark Rothko Skew-Whiff (SubRosa, 1990) due brani di Charles Hayward e li sottopone alle attenzioni di Maxmillion Dunbar e JD Twitch: originali e reinterpretazioni li dispone poi in un elegante doppio vinile cui dà il titolo uno dei brani, Smell of Metal. Berceuse Heroique' Kemal sublabel reissues some percussive tributes to Mark Rothko by This Heat's Charles Hayward, backed with JD Twitch and Maxmillion Dunbar remixes. 'Smell of Metal' gives a first vinyl issue of the title track and 'Lopside' from Hayward's 1990 CD for Sub Rosa, unleashing two tense, minimalist pieces of rolling drums and etheric drones that sound like the missing link between 1980s post punk and '90s electronic experimentation. 'Lopside' steps to a skinny, prickling groove rent with panned electronics and icy keys, awash with the clang of metal objects and helmed by Hayward's tight, shuffling hi-hat and kick syncopation. 'Smell Of Metal' is slower, with spectral vibes reminding of Basquiat's Gray unit, while JD Twitch's take on 'Lopside' is squashed to a late night bump and fleshed out with shimmering chords, and Beautiful Swimmers' Maxmillion Dunbar rolls 'Smell Of Metal' into a more fluid, dizzied disco-no-disco groove. Featuring artwork by Will Bankhead, it's another excellent package from this promising label. Dopo Magaibutsu, anche Skin Graft Records pubblica il secondo album dell'inarrivabile duo Sax Ruins, Blimmguass, in una doppia versione in vinile (salmonato) e in cd. 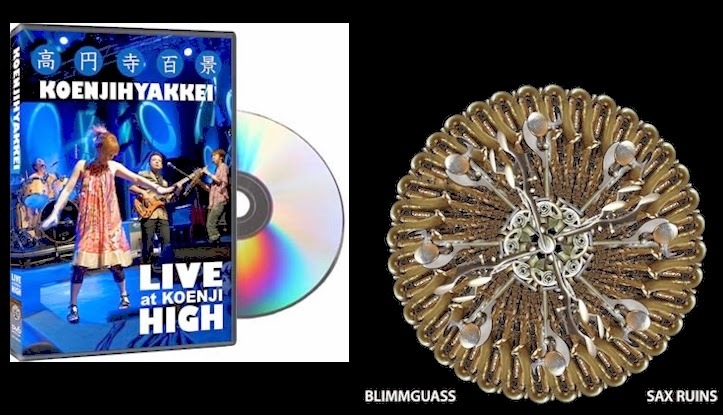 Su richiesta procura anche una copia in dvd di un concerto di un altro celebrato progetto di Tatsuya Yoshida, il quintetto Koenjihyakkei: Live at Koenji High. Though he's renowned for his roles in Acid Mother's Temple and Zeni Geva and for leading the bands Koenjhyakkei and Koekyojinn, Tatsuya Yoshida always comes back to Ruins. Since 1985, Ruins has been Yoshida's primary musical outlet – always minimalist in instrumentation, but maximalist in compositional complexity. 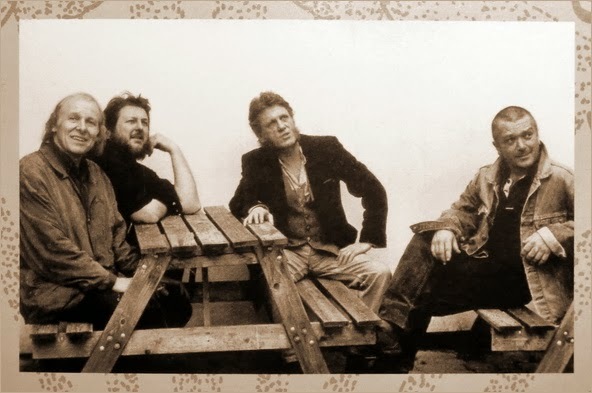 Ruins' first two decades were defined by it's drum / bass line-up, with Yoshida remaining as the band's constant, while Ruins' bass duties would change hands four times. The last, Sasashi Hisaki, departed in 2004. Since then, Ruins has evolved into a one-man show, with Yoshida doing what at first seemed impossible, playing it all himself - as documented on Skin Graft's 100th release “Ruins Alone”. Beginning in 2006, Yoshida would occasionally fill the vacant second slot not with a bassist, but with alto saxophonist Ono Ryoko. Ono has become one of Japan's most in demand studio musicians, performing jazz, rock, funk, rhythm & blues and hip hop, as well as leading her own band, Ryorchestra. Like Yoshida, she has created her a musical language all her own, using a "non-breath" circulation technique and multi-phonics to pursue endless, rich and complex sounds in a progressive and classical tradition. In 2009, Ipecac label issued Sax Ruins' debut recording “Yawiquo”, which found Tatsuya and Ono reinterpreting many of Ruins classics with brass in place of bass. Their new album “Blimmguass” is highlighted by an all-new composition commissioned by New York's brass band Asphalt Orchestra which premiered at the Lincoln Center in April of 2012. Where the Sax Ruins' first outing focused on short pieces, “Blimmguass” expands its reach to lengthier, meticulously orchestrated compositions, including Ruins' classics like Vrresto and Bighead, as well as improvised pieces which reflect the Sax Ruins Live experience. Sax Ruins transforms Yoshida's compositions from heavy, nimble prog to dense, hyper-kinetic big band jazz, not entirely unlike Sonny Rollins sitting in with Magma and Carl Stalling on the Warner Bros. lot or Borbetomagus calculating a perfectly timed collision with Naked City. The Artaud Beats (Geoff Leigh: sax, fl, vo, electronics, Yumi Hara: p, vo, Chris Cutler: dr, John Greaves: b, vo) came together in a chance encounter at Jean-Hervé Péron 's Avantgarde Festival in Schiphorst, 2009. 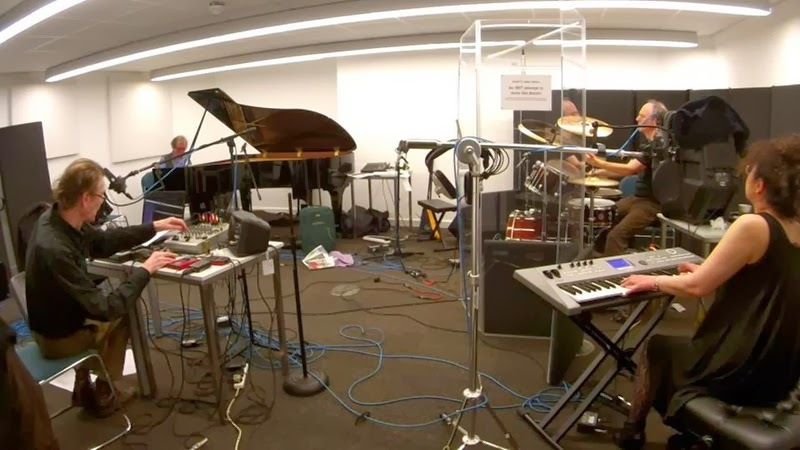 Geoff Leigh and Yumi Hara were there as a duo, Chris Cutler and John Greaves with Peter Blegvad and Dagmar Krause. 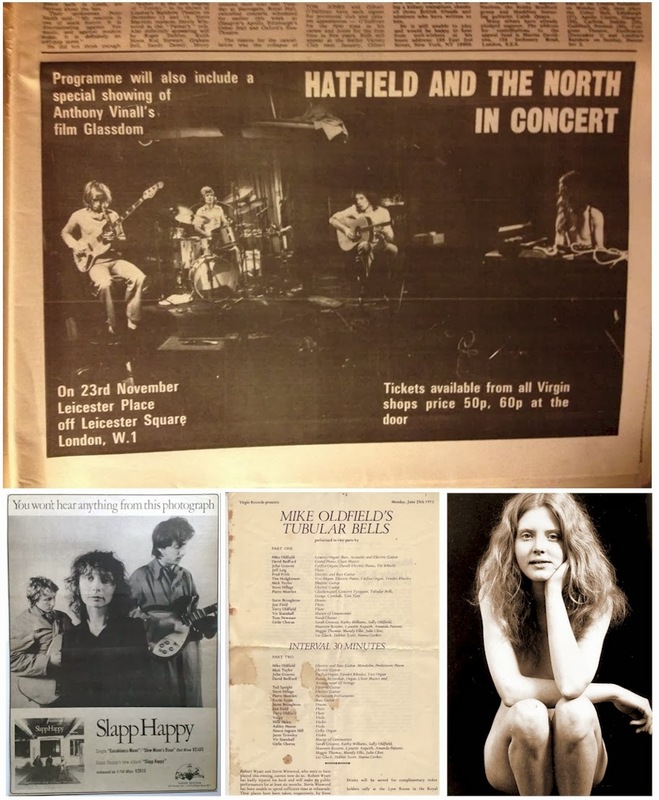 It was Geoff who proposed the quartet and Jean-Hervé enthusiastically supported the idea - since Geoff, Chris, and John had all been in Henry Cow together when they toured with Faust; and Yumi seemed the perfect companion. The concert was fine, the public happy and a Norwegian promoter from Bodo, who happened to be in the audience, immediately invited us to his next festival. So our casual meeting metamorphosed into a band. We gave ourselves a name: The Artaud Beats, and made ourselves available. Two tours of Japan and a box-set later, we 're back - still with no programme and no songs, and still engaged in the hazardous but honourable art of conjuring music out of empty air. The Artaud Beats est dû à une rencontre fortuite, au festival Avantgarde de Jean-Hervé Péron à Schiphorst, en 2009. Geoff Leigh et Yumi Hara s'y produisaient en duo, Chris Cutler et John Greaves avec Peter Blegvad et Dagmar Krause. 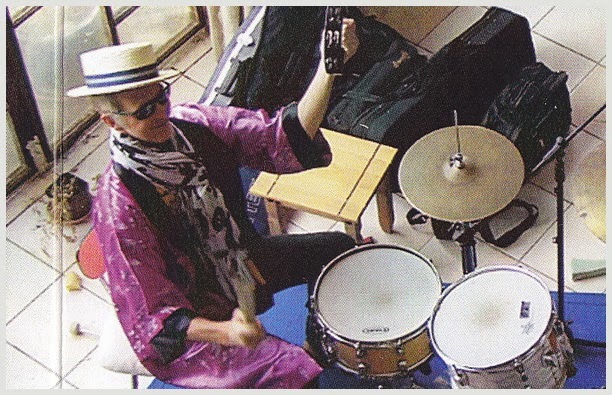 L'initiative est venue de Geoff, et Jean-Hervé l'a soutenue avec enthousiasme : Geoff, Chris et John jouaient déjà ensemble au sein de Henry Cow à l'époque où le groupe tournait avec avec Faust, et Yumi s'imposait comme comparse idéale. Le concert a été un succès, et il se trouve que dans le public comblé était présent un agent norvégien originaire de Bodo, qui nous a aussitôt invités pour l'édition suivante de son propre festival. Et c'est ainsi que la rencontre informelle a débouché sur la formation d'un vrai groupe. Nous sommes sommes baptisés The Artaud Beats, nous nous sommes rendus disponibles. Deux tournées japonaises et un coffret plus tard, nous voici de retour, toujours sans morceaux ni répertoire, mais bien décidés à nous adonner à l'art périlleux mais honorable consistant à faire naître de la musique à partir de rien. Celebri pagine di Gravity - e Killing Time - rilette ad alta voce in concerto da Fred Frith con un giovane ensemble californiano: Aaron Novik, Dominique Leone, Ava Mendozam, Jon Leidecker, Jordan Glenn, Kasey Knudsen, Lisa Mezzacappa e Marie Abe tra gli altri. Una sintesi è su YouTube. Sempre su YouTube c'è traccia del solo tenuto da Frith pochi giorni fa al club The North Door ad Austin (Texas), mentre dalla BBC sarà registrato e trasmesso il concerto che questo fine settimana si terrà a Glasgow con partiture di Frith (The Right Angel, del 2003), Roscoe Mitchell e George Lewis eseguite dalla Scottish Symphony Orchestra con la partecipazione dei tre autori. 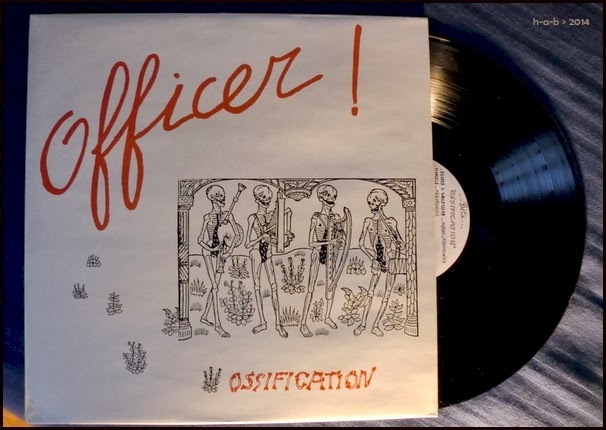 Ossification torna in circolazione trent'anni dopo la sua prima uscita - per Ayaa, nel 1984 - in un'edizione in vinile a tiratura limitata curata dalla statunitense Knock'em Dead Records, che con malcelato orgoglio lo annuncia come 'a timeless anomaly in the history of recorded music'. Con Mick Hobbs, responsabile del progetto Officer! nelle sue varie e intermittenti incarnazioni tra il 1983 e il 1988, c'erano per l'occasione Tim Hodgkinson, Bill Gilonis, Rick Wilson, Catherine Jauniaux, Tom Cora, Georgie Born, Zeena Parkins, Andy Bole e Felix Fiedorowicz tra gli altri. Per completare ascolto e conoscenza si può utilmente attingere a un post ancora accessibile presso l'ahimé defunto blog di Continuo. Bob Drake sarà ospite questa sera del programma The Interesting Alternative Show condotto da Steve Davis e Kavus Torabi per l'emittente Phoenix FM a Brentwood, nell'area metropolitana di Londra. 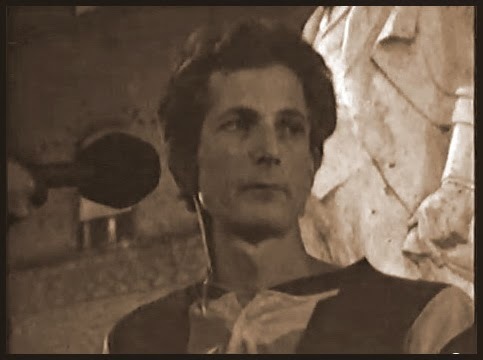 Tra le sue proposte ci saranno certamente brani tratti dal nuovo album Lawn Ornaments - la cui pubblicazione ha subìto qualche ritardo per problemi nella realizzazione grafica - e forse qualche anticipazione dell'album successivo, tuttora in lavorazione e dal titolo provvisorio 20 Nitre-Encrusted Hits!. Drake si tratterrà a Londra in settimana per due concerti con The Capybaras - Bing Selfish, Ray Hogan e Caitlin Hogan - il 20 (The Stag’s Head) e il 22 febbraio (Union Chapel). 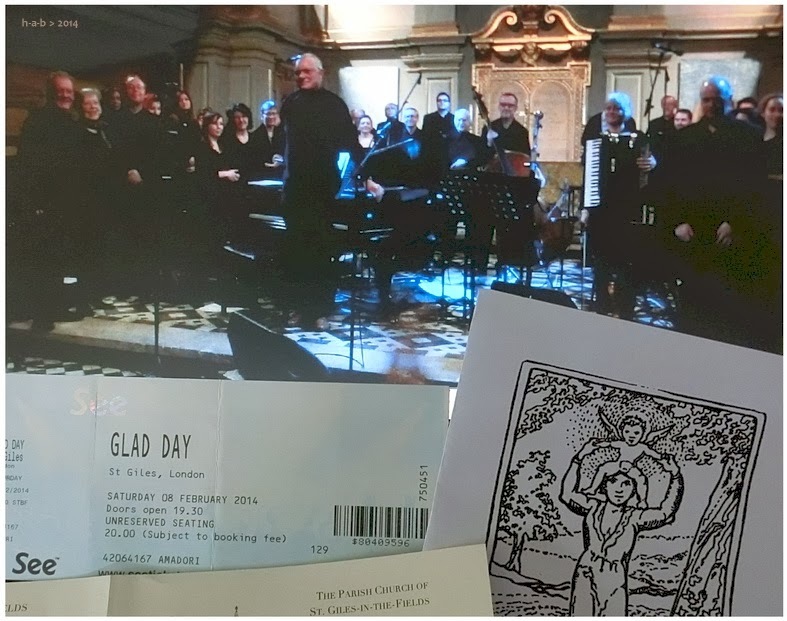 Il concerto di Glad Day della settimana scorsa, ambientato nella 'chiesa dei poeti' di St Giles-in-the-Fields a Londra, si è tenuto per iniziativa dei Westbrook assieme all'associazione di volontariato Simon Community, da mezzo secolo impegnata a favore dei senzatetto della capitale. 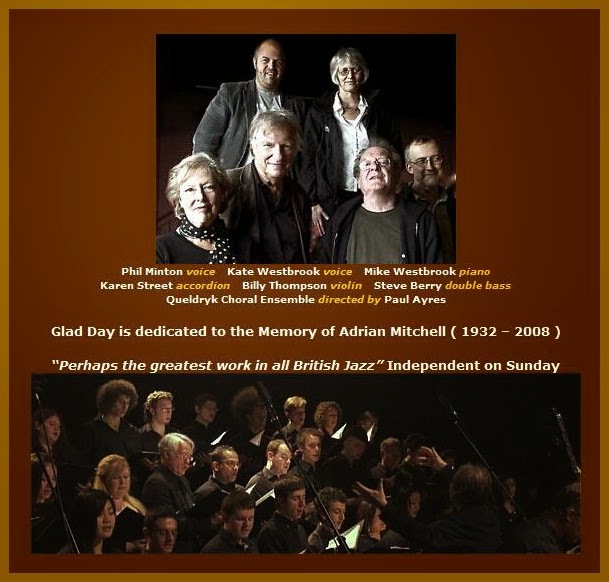 Richard Williams ne scrive al suo blog The Blue Moment, con un'interessante premessa: "The parish church of St Giles-in-the-Fields turned out to be the perfect place for last night’s performance of Glad Day, Mike Westbrook’s settings of William Blake’s poetry. Situated close to the modern junction of Charing Cross Road, Oxford Street, Tottenham Court Road and New Oxford Street, and known as the Poets’ Church, the present building was completed in 1733 on the site where first a monastery and chapel and then earlier churches had ministered to lepers (St Giles is their patron saint) since the 12th century. The first victims of the Great Plague of 1665 were buried in its garden. Blake was born in nearby Soho and in his time the church stood next to the warren of dwellings known as the Rookery, London’s most notorious haunt of thieves and prostitutes, immortalised in Hogarth’s Gin Lane drawings and Dickens’s Sketches by Boz. It’s a gentler place now, although had Blake, Hogarth and Dickens been living today they might have been interested to leave the church, turn left down Denmark Street, cross Charing Cross Road and witness the sights of 21st century Soho on a Saturday night." 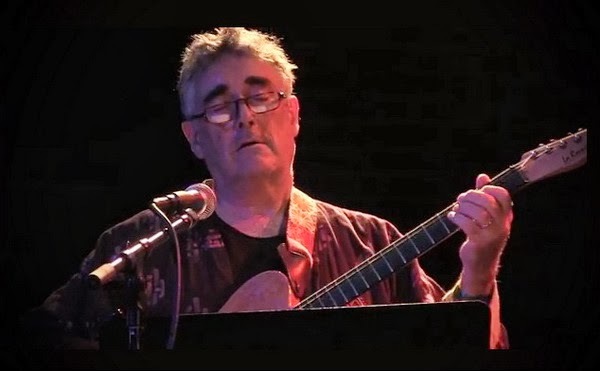 L'evoluzione compiuta dal programma westbrookiano sulla poesia di Blake nell'arco di oltre quarant'anni è richiamata da Chris Parker nella sua recensione per LondonJazz, dove sono indicate anche le varie tappe discografiche: "Initially composed for Adrian Mitchell’s National Theatre production, Tyger, many of the songs in this programme of William Blake poems set to Mike Westbrook’s music date back to 1971. 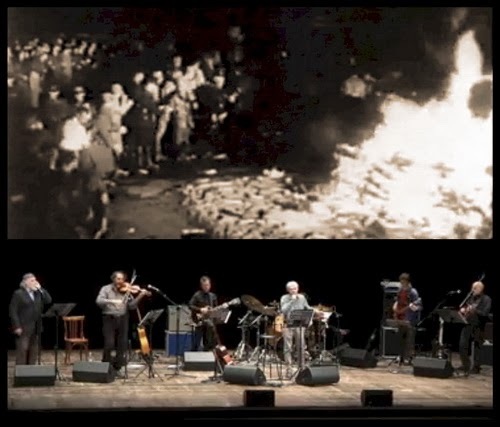 Material has been added over subsequent years for performances by the composer’s Brass Band, for a 1980 Impetus recording, Bright as Fire, an Enja album, Glad Day in 1997, and – most recently – a DVD and CD, Glad Day Live (Westbrook Records), documenting a 2008 performance utilising the forces (two singers, jazz quartet, large choir) deployed on this occasion, a concert presented by the Simon Community, a charity for the homeless. The songs have also been sung (usually by Kate Westbrook and Phil Minton, the performers here, at St Giles-in-the-Fields) with various local childrens' choirs, initially in Blackheath in 1996, but also – using the instrumentation of this concert, accordion, violin, piano, bass – to mark the 250th anniversary of Blake’s birth in 2007 at the Foundling Museum as part of the St Pancras Festival of Contemporary Music. This history is worth tracing in such detail because it shows how important the Blake settings have been in Mike and Kate Westbrook’s careers to date; indeed, they neatly encapsulate many of the Westbrooks’ most dearly held artistic beliefs: above all in the power of literary texts to move and inspire, but also in the importance of allowing notions of social justice, consequent upon engagement with historical, political (and spiritual) complexity, to inform their music." Un raro titolo Incus - il numero 11 del glorioso catalogo - riappare tramite Inconstant Sol: Balance, inciso nel settembre 1973 dall'omonimo quintetto comprendente Ian Brighton, Colin Wood, Frank Perry, Radu Malfatti e Phil Wachsmann e rimasto loro unico album. Nuova occasione domani per seguire dal vivo il lavoro degli Stormy Six con Moni Ovadia Benvenuti nel ghetto: a Milano, al teatro Elfo Puccini, ore 21.00. Così iniziava a raccontare l'esibizione dell'anno scorso a Reggio Emilia - poi documentata su cd e dvd - Angela Albanese su Doppiozero: "“È forse là, dove qualcuno resiste senza speranza, il luogo dove inizia la storia e la bellezza dell’uomo”. I versi di Yiannis Ritsos aprono Benvenuti nel ghetto nato dalla collaborazione di Moni Ovadia e degli Stormy Six, in scena all’Ariosto di Reggio Emilia. Con lo spettacolo gli artisti milanesi hanno voluto rievocare, a settant’anni di distanza, la rivolta del ghetto ebraico di Varsavia del 19 aprile 1943, finita con l’annientamento degli ebrei e con la distruzione del ghetto più grande d’Europa. Versi incisivi, quelli scelti da Ovadia, che calano lo spettatore subito nel cuore del tema. E il tema non è qui solo lo spaventoso sterminio delle migliaia di ebrei del ghetto, ma è soprattutto la resistenza armata che uomini e donne, vecchi e bambini, ragazze e ragazzi, guidati dal ventiquattrenne Mordechai Anielewicz e riuniti nella Zob (Organizzazione Ebraica di Combattimento), per la prima volta hanno saputo opporre per 27 giorni alle SS del comandante Jürgen Stroop. Una rivolta, questa, morale più che militare, essendo chiara la volontà di Hitler di ripulire l’Europa dagli ebrei e altrettanto chiara, in ciascuno di loro, la consapevolezza della fine. Si trattava perciò di un atto inutile a salvarsi la vita, ma necessario per riaffermare la dignità umana di fronte alla barbarie del totalitarismo nazista. È questa dignità, “l’estrema dignità del ghetto di Varsavia che muore bruciando, ma non gridando”, che Moni Ovadia, insieme allo storico gruppo musicale degli Stormy Six, porta in scena nella formula di un “recital oratorio con canzoni”. Vi si intrecciano, in un misurato accordo, il racconto e il canto, il primo affidato alla voce narrante di Moni Ovadia e il secondo a quella di Umberto Fiori e alle musiche degli Stormy Six, nate con e per il progetto di Ovadia." Esce a giorni per la giapponese Arcangelo Phosphorescent Dreams, album che segna un nuovo capitolo - e una nuova formazione - nella lunga storia dei belgi Univers Zéro. Lo descrive quasi con trepidazione Daniel Denis: "I wanted this 13th album to open the band's music to other directions, different sound and musical structures, different from the ones that had been in use for years. I think it is necessary and crucial for a group to question itself now and then. The old form was stagnant and did not give the impression of change, and the consequences were increasingly demotivating. So there was no choice, I felt I had to take the difficult decision to break up the group. Luckily I had met Nicolas Dechene and Antoine Guenet who could contribute with freshness and new energy to this next incarnation of UZ. 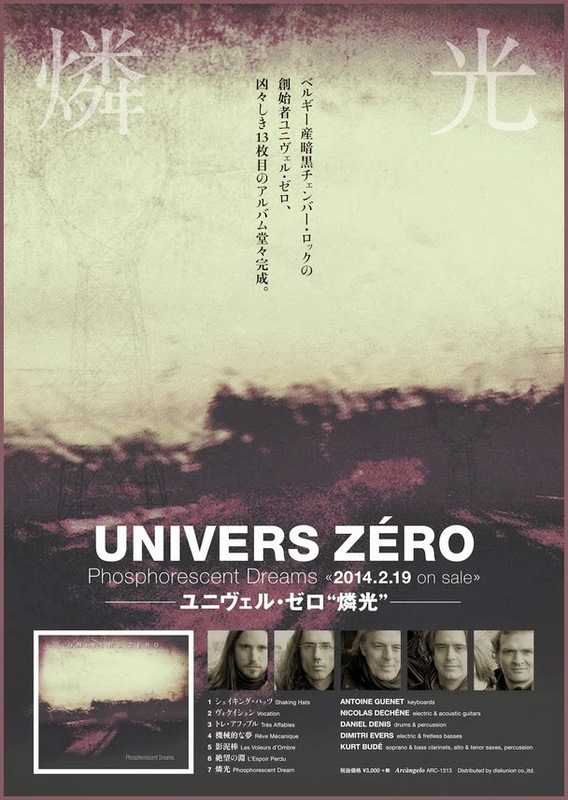 I wanted the future of Univers Zero's music to have less noise than before and to obtain new energy in a more rock and electrical orientation, and integrated with guitar. Mixing Kurt Bude compositions with mine, forms an excellent rich diversity in fusion. Each track on the disc has its own identity and its own color. I really think this CD has reached maturity, and after 40 years of existence I can truly say UZ is again taking an important step. And never forget Didier de Roos who mixed this CD, contributed to the sound, and as always, elevated the music to higher levels." Un bilancio delle prime esperienze in seno al gruppo da parte del giovane tastierista, Antoine Guenet, è espresso in http://tinyurl.com/p72sand. 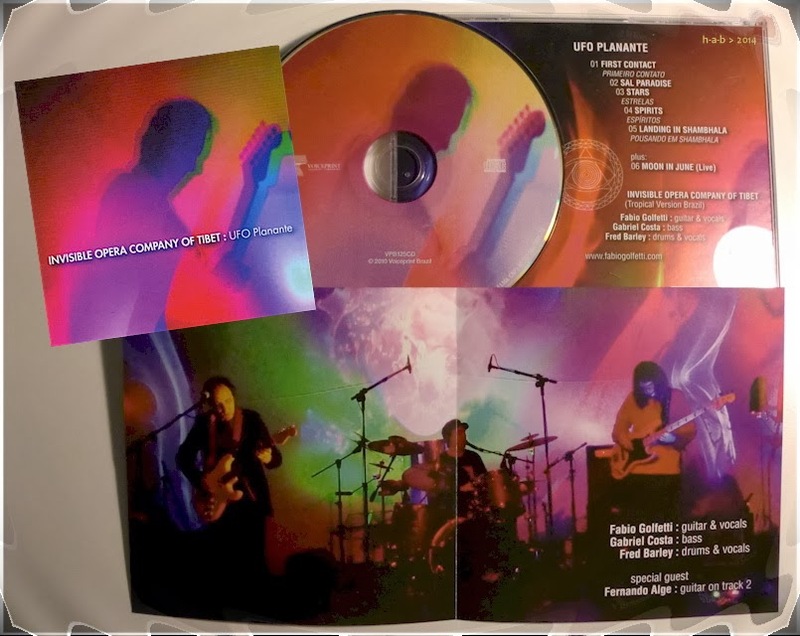 Torna disponibile presso Planet Gong qualche copia dell'album UFO Planante realizzato nel 2010 dal chitarrista Fabio Golfetti con la divisione brasiliana dell'Invisible Opera Company of Tibet (qui un trio 'tropical' con Golfetti, Gabriel Costa e Fred Barley), pubblicato in cd da Voiceprint ma di difficile reperibilità se non in formato digitale attraverso Bandcamp. Oltre a brani originali e ovvie ambientazioni gonghiste c'è una strepitosa versione integrale della wyattiana Moon in June, ripresa dal vivo nel settembre 2007 e subito documentata su YouTube. 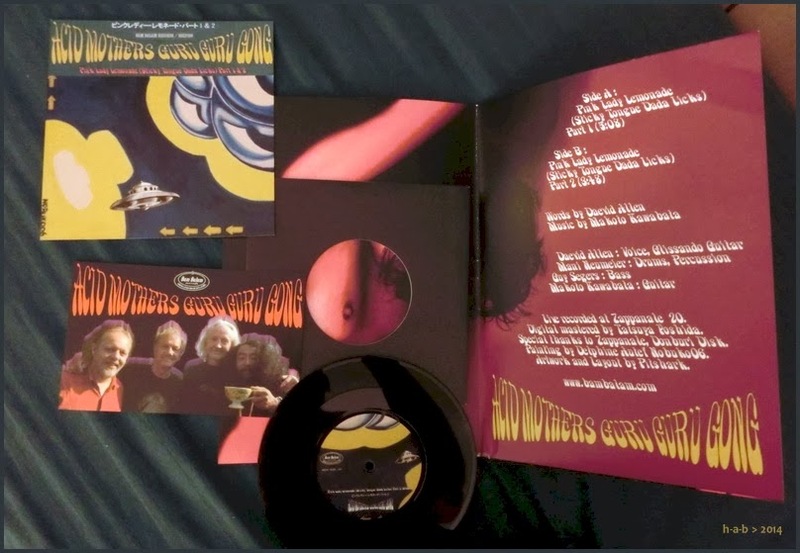 Un breve estratto dall'apparizione allo Zappanale del 2009 del super-quartetto di Makoto Kawabata, Mani Neumeier, Guy Segers e Daevid Allen - battezzato per l'occasione Acid Mothers Guru Guru Gong - è riportato in un vinile a tiratura limitata pubblicato dalla francese Bam Balam, con lo zampino di Tatsuya Yoshida: Pink Lady Lemonade (Sticky Tongue Dada Licks). Makoto Kawabata of Acid Mothers Temple, Mani Neumeier of Guru Guru, Guy Segers of Univers Zero and Daevid Allen of Gong recorded live at the Zappanale 20 Festival in Germany playing a new, lyrically alien-enhanced, version of the Acid Mothers favourite Pink Lady Lemonade - wonderful stuff. In a veritable ocean of Frank Zappa tribute bands, many playing Zappa tunes to the stunning highest of orders (some even with real live ex-Mothers in them), an improvising quartet of psychedelic mavericks was always going to stand out in a rather marvelous way. This is a highly desirable and most suitable artifact to mark a musical conflagration which was one undoubtedly one of the highlights of the Festival. La rivista britannica Shindig! pubblica uno speciale numero dedicato all'epopea dello spacerock, riportando suggestioni, aneddoti, miti popolari e gesti autentici di Sun Ra, Pink Floyd, Magma, Hawkwind, Gong, corrieri cosmici, Chrome e Ozric Tentacles tra i molti altri: Interstellar Overdrive. This special edition of Shindig! explores spacerock’s peculiar mix of heavy riffs and electronics through the age of the space race, the resulting sci-fi explosion and the mind-expanding influences of the acid-fried ’60s and beyond. We trace spacerock back to its roots with the soundtracks of the ’50s, including Louis and Bebe Barron’s Forbidden Planet, through to the incredible work of Joe Meek on Telstar. In addition, we will cover the social and cultural context of the moon landings, sci-fi literature and the spaced-out cinema that shaped the end of the ’60s. In this environment came early spacerock efforts from The Jimi Hendrix Experience, Pink Floyd and The Byrds. One band arrived at the close of the decade to define the genre - Hawkwind. Just as influential in their own idiosyncratic way were Gong with their Radio Gnome trilogy. Several artists pursued the electronic side of spacerock, such as Silver Apples and Fifty Foot Hose, whilst the BBC Radiophonic Workshop added a distinct Britishness to proceedings. The Germans also produced their own unique contributions to the idiom with Amon Düül II, Neu and Ash Ra Tempel. At the close of the ’70s several artists such as Chrome utilised the punk spirit to reinvigorate spacerock. 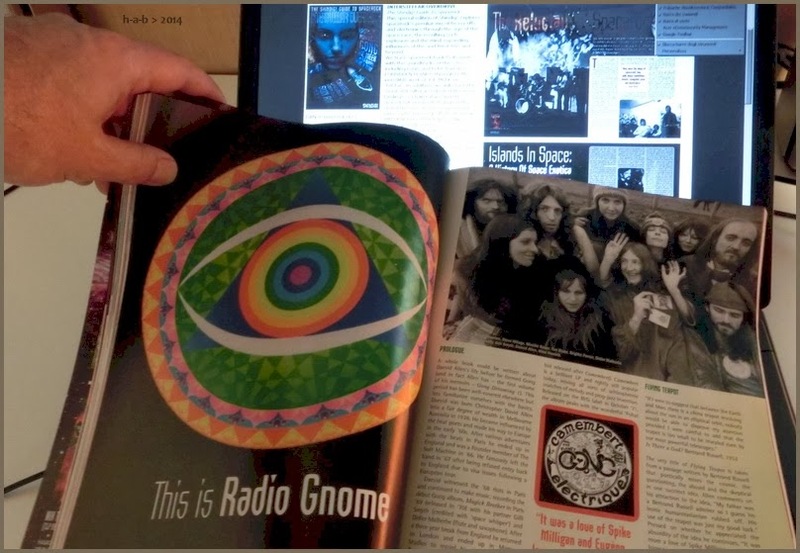 The magazine will take the genre through the ’80s and ’90s with Ozric Tentacles and the cross-pollination of the indie scene with Spacemen 3 and Loop. Taking things up to the present day and proving the genre is still in rude health are the likes of Astra, The Heads and White Hills. There will also be numerous diversions through key spacerock obscurities as well as articles from the likes of Jonny Truck, Patrick Lundborg, Ian Abrahams and Rich Deakin. La storia dei primi anni della Virgin ricordata collettivamente attraverso immagini, ritagli di giornale, poster, curiosità, reperti autentici e personali trofei: guida la discussione su Facebook Mike Grant. Giunge invece ai giorni nostri il racconto di Richard Branson su YouTube, sempre in occasione del quarantesimo compleanno dell'etichetta. La rara opportunità di seguire dal vivo una completa esecuzione di Glad Day, il capolavoro westbrookiano sull'opera di William Blake, si presenta due volte nei prossimi giorni: l'8 febbraio a Londra, nella 'chiesa dei poeti' di St Giles-in-the-Fields, in un'estesa versione corale cui prende parte il Queldryk Choral Ensemble diretto da Paul Ayres, e l'11 febbraio in Francia, a Cenon vicino Bordeaux, nella versione per solo sestetto (Mike e Kate Westbrook, Phil Minton, Billy Thompson, Karen Street e Steve Berry). Particolare importanza - per la consonanza di tempo e luoghi, ricorrenze e ambientazione - assume l'appuntamento londinese di domani sera, che Mike Westbrook così evidenzia nell'ultimo numero dello Smith's Academy Informer: "This concert is dedicated to the memory of the poet Adrian Mitchell. My involvement with William Blake’s poetry began with Adrian’s musical Tyger staged by the National Theatre in 1971, down the road from St Giles-in-the-Fields, at the New Theatre now the Noel Coward Theatre in St Martin’s Lane. In Tyger the songs were performed by actor/singers and our band consisted of trumpet, trombone and saxophone, guitar, bass guitar, drums, Hammond organ and piano. The show’s West End run, a controversial, and much criticised venture for the National Theatre in the days of Laurence Olivier’s tenure, turned out to be our one and only incursion into mainstream entertainment. However, Adrian’s subversion of the stage musical genre was not calculated to win over the New York impresario in the audience. Blake on Broadway - that would have been something! Alternative theatre beckoned. The Brass Band, which began as an adjunct to theatre groups, soon took off in its own right. It soon claimed the Blake songs as its own. Phil and Kate have sung them ever since. We have taken these songs into many countries, to Europe and as far afield as New York and Australia. 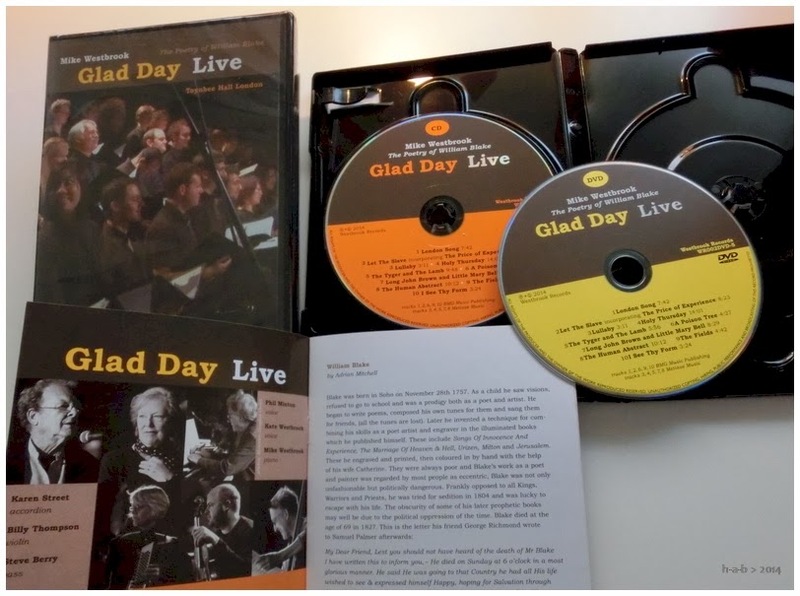 The DVD Glad Day Live, filmed in 2008 at a performance at Toynbee Hall, attended by Adrian Mitchell just shortly before his death, is the fifth version of this material that we’ve recorded. Blake’s poetry has continued to inspire the many musicians who have travelled with us over the years. The personnel and instrumentation of the band have varied enormously. A special concert at The Foundling Hospital in 2007 brought us together for the first time with the present combination of accordionist Karen Street, violinist Billy Thompson, bassist Steve Berry and Paul Ayres’ choir. Many of our most memorable performances of the Blake have been in London. William Blake was a Londoner, born in 1757 in Soho. His voice still resonates through the city’s streets in poems like London Song from his Songs of Experience. In The Fields from Islington to Marybone, with its references to Pancras and Kentish Town, he evokes the semi-pastoral London of his day, in his imagination gloriously transformed. He might easily have included St.Giles-in-the-Fields, which he surely knew well. It is a great privilege for us to be working with the Simon Community and to perform this selection of William Blake’s poetry in The Poets’ Church." This is a rare chance to see what was described in the Independent on Sunday as “perhaps the greatest work in all British jazz”. Mike Westbrook’s settings of William Blake’s powerful poetry, originally commissioned in 1971 for the National Theatre production of Adrian Mitchell’s Tyger, have been performed throughout Europe and in New York and Australia, by a succession of Westbrook ensembles. A DVD supported by Airshaft Trust of the choral version, filmed 'live', is released to coincide with the concert at St Giles-in-the-Fields. Marking the 50th anniversary of the foundation of The Simon Community, a registered charity that reaches out to homeless people, offering a radical alternative to institutional care, particularly for those for whom no other services exist. The Simon Community refuses government funding to ensure its independence, integrity and freedom to campaign. St Giles-in-the-Fields, in the heart of London’s West End, occupies a site where a church has stood since the 12th century. It is commonly known as ‘The Poet’s Church’ and has a long history of providing relief for the poor and today supports the work of the Simon Community. William Blake was born in Soho in 1757. A poet and artist regarded in his lifetime as eccentric and politically dangerous, Blake is now acknowledged as one of the great visionaries in British Art whose work resonates strongly in the 21st Century. 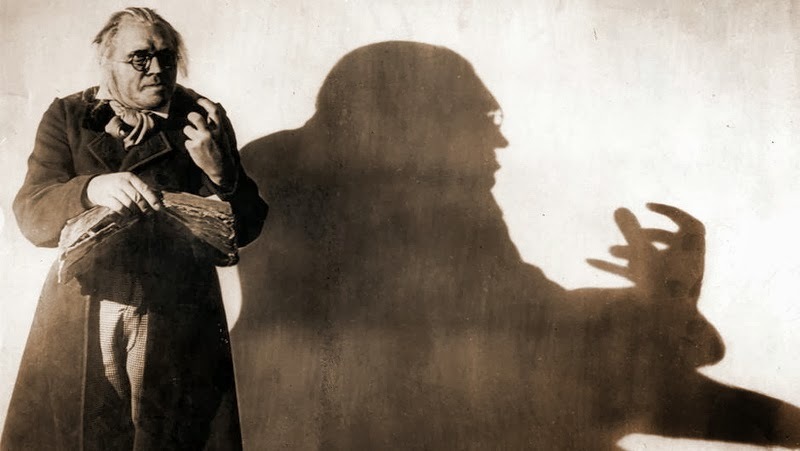 Arte presenta la settimana prossima una edizione da poco restaurata del celebre film muto di Robert Wiene Das Cabinet des Dr. Caligari, girato nel 1920 e ritenuto uno dei massimi capolavori dell'espressionismo tedesco. Le musiche di questa nuova versione sono di John Zorn. Salué partout comme un chef-d'œuvre, le film de Robert Wiene marque le début de l'expressionnisme allemand. L'extrême nouveauté de son esthétique – l'emploi systématique du studio et des toiles peintes, les déformations et l'irréalisme du décor – vaut au film une renommée qui attire, à l'époque, l'attention du monde entier sur un cinéma allemand boycotté depuis le premier conflit mondial. Le film favorisa également la célébrité de Conrad Veidt, qui devint l'une des grandes figures du cinéma muet allemand. Acteur hanté, son jeu dans Le cabinet du docteur Caligari est à lui seul un manifeste de l'expressionnisme. Son corps désarticulé, son regard fixe et fiévreux et la précision de ses gestes donnent vie et émotion au film. ARTE présente ce soir une version du film restaurée en 4K (le fin du fin en matière de haute définition), réalisée sous la houlette de la Friedrich-Wilhelm-Murnau-Stiftung et de L'Immagine Ritrovata de Bologne. L'utilisation du négatif caméra, négligé lors des dépoussiérages antérieurs, a permis retrouver la qualité et les couleurs originelles de l'image, la chronologie précise du film et les intertitres expressionnistes. D'excellente qualité, il était en revanche incomplet. Il a donc fallu trouver les deux bobines manquantes dans des copies export. 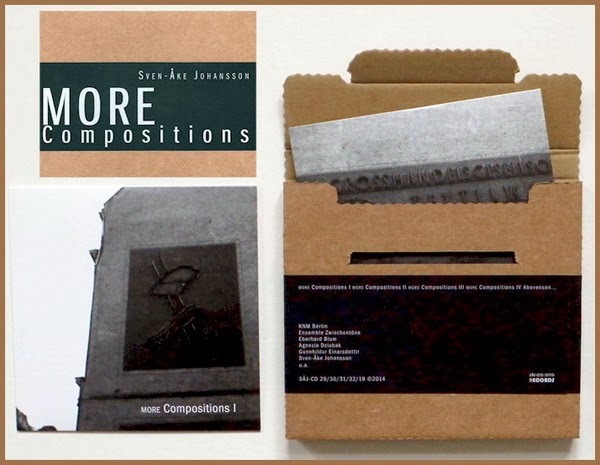 Cette version s'accompagne d'une nouvelle musique, composée par le New-Yorkais John Zorn, connu pour mêler diverses influences : musique contemporaine, free jazz, noise, punk ou folklore juif. L'etichetta britannica Keyhole cura la ristampa in cd di Zimbabwe, secondo e ultimo album della formazione Assagai guidata a inizio anni settanta da Dudu Pukwana e di cui facevano parte tra gli altri Mongezi Feza, Louis Moholo e vari membri di Jade Warrior. Uscito per la Philips nel 1971, dopo un provino per la Vertigo, l'album circolò per qualche tempo in altra edizione con il titolo AfroRock, prima di sparire ufficialmente dalla circolazione. The second Assagai album has an interesting and somewhat schizophrenic history. It was initially released in late 1971 under the name Zimbabwe: a test pressing was made on the Vertigo "swirl" label but the actual release of the album took place on the Philips label. The album's cover and sleeve were designed and drawn by noted album-artist Roger Dean. 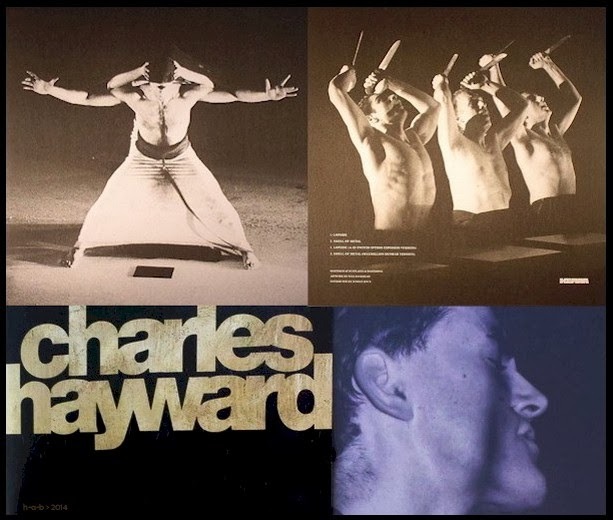 All musicians are credited on the back cover; Jade Warrior members Tony Duhig, Jon Field, and Glyn Havard are credited for both performance and songwriting. 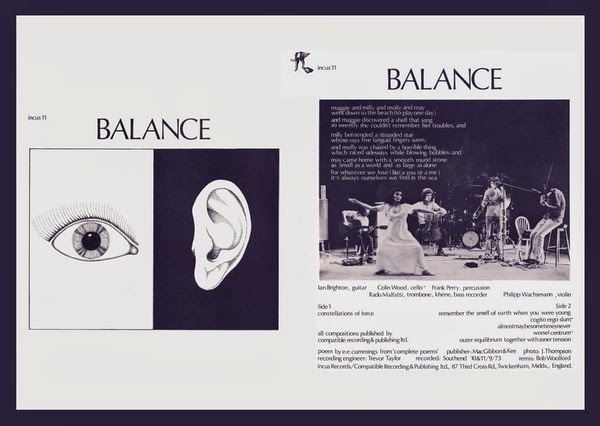 At some later date, the album was re-issued by the "Music For Pleasure / Sounds Superb" label, under the name AfroRock, with a completely different cover and sleeve. The back cover makes mention of the fact that the album had been released previously, but doesn't explain (or even mention) the change of name. No musician credits are given. This LP has reportedly been reissued in 2010 (as Zimbabwe). The reissue has been described as being an unauthorized, limited-quantity issue, very probably a dub from a first-generation vinyl pressing (i.e. not made directly from the master tapes). The cover is reportedly a reproduction of the original (including the Philips stock number), but the LP itself has black labels which do not mention Philips or Vertigo. 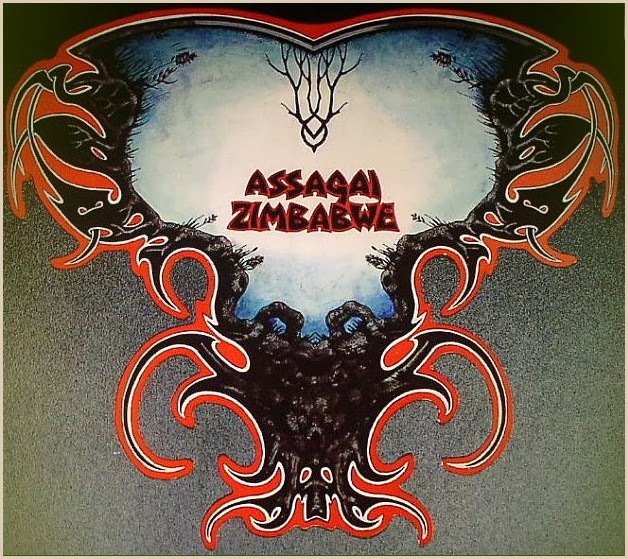 Like Assagai's first album, Zimbabwe includes a mix of original tunes written by members of the band (including newcomer Martha Mdenge) and cover versions of Jade Warrior tunes - specifically Barazinbar (from Released) and Sanga (from Eclipse). There's also a new song Kinzambi written by Tony Duhig. 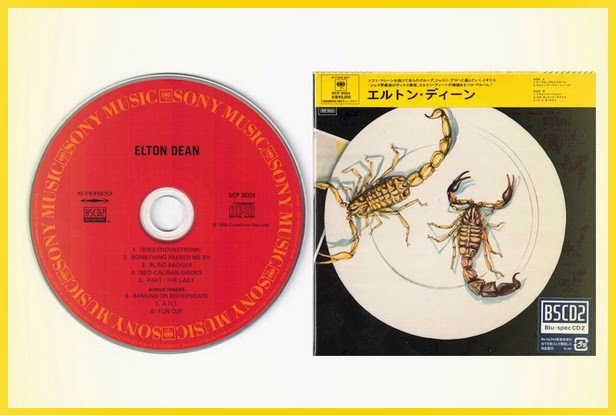 Sony Music Japan ha prodotto una versione Blu-spec CD2 dell'album di esordio come titolare di Elton Dean (1971). Per la gioia di grandi e piccini. 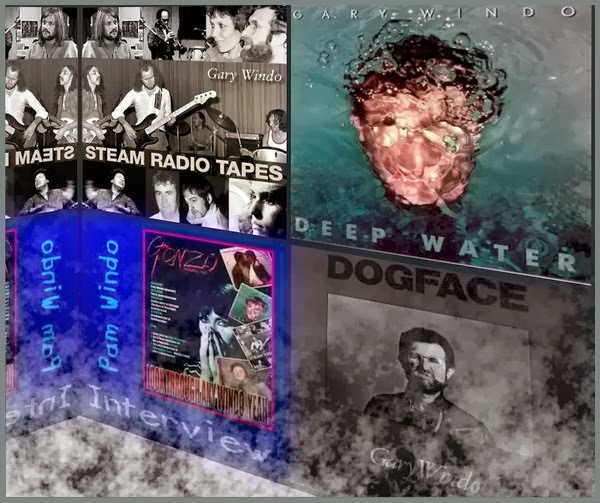 Ristampe, rarità e preziosi materiali d'archivio del compianto Gary Windo tornano attuali in tre edizioni curate da Gonzo Multimedia: Dogface (1982), Deep Water (1988), e l'inedito Steam Radio Tapes, con registrazioni effettuate tra il 1976 e il 1978 mai pubblicate all'epoca e recentemente restaurate da Mike King. Del sassofonista ha detto Robert Wyatt: "Although he'd had a tough life even before I met him, Gary's music had the (almost!) innocent joy of a child, still full of wonder and excitement. He was nothing like most English jazz musicians: a rather guarded, suspicious lot in those days. He seemed oblivious to careerist ambition. And he had SOUL. Naturally absorbing both R&b honking tenor sax swagger with the sensitive tonal nuances and courage of Archie Shepp... a complete musician." Quarant'anni fa quasi esatti Robert Wyatt offriva al mondo la sua versione di I'm a Believer, brano di Neil Diamond reso celeberrimo nel 1967 dai Monkees. 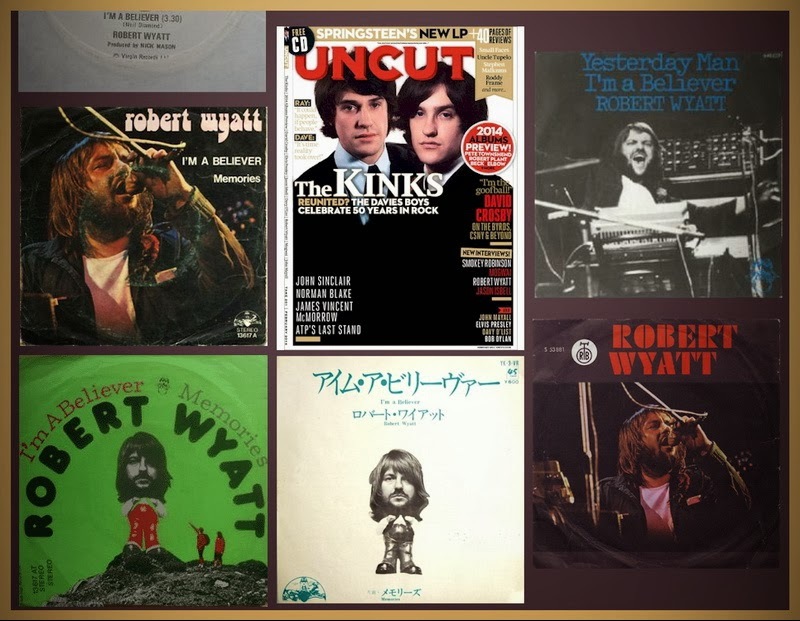 Wyatt lo incise ai primi di agosto 1974 con Fred Frith, Dave MacRae, Richard Sinclair e Nick Mason; uscì come singolo per la Virgin il 6 settembre. Rievoca quel momento il numero di questo mese della rivista Uncut: The Making of I'm a Believer.